“Learning to Stand” explores the relationship between what we think & what we really are. There is a sense of total control & confidence, which is expressed in the top form, often seen first. However, as one gets closer to the base, it is clear that what supports these emotions are a fractured composition of that confidence balanced on a single point. This sculpture tells the story of learning to walk through life with confidence & determination despite the at times existing betrayed this internal sense of solidity. The main tower stands in perfect verticality & relates to so much of our built environment: solid & permanent. The lower two pieces are cut from the same column, yet they convey a different aspect of that solidity & permanence. 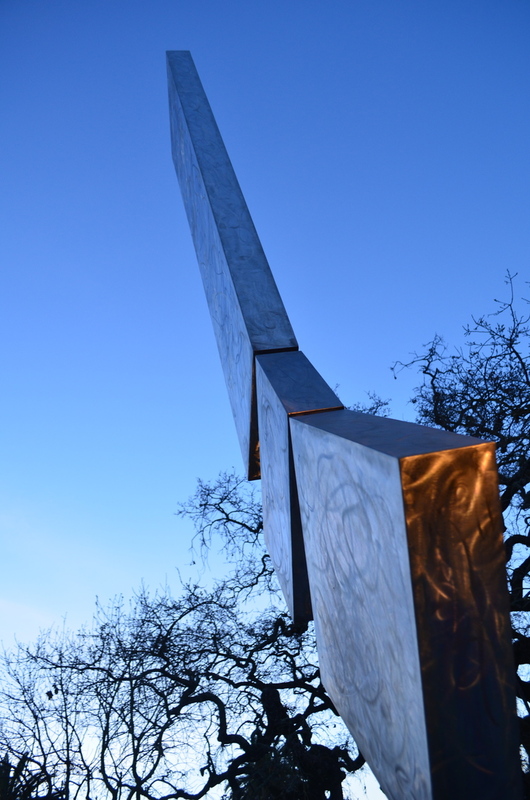 Originally installed in the heart of Yountville, “Learning to Stand” reflected the strength in the growing arts community in the area also putting one foot in front of the other to create a stronger more connected whole.